The old Tilldale white milking barn is covered in dust. An old Horizon milk plaque, washed over with a coat of primer, hangs on an outside wall. 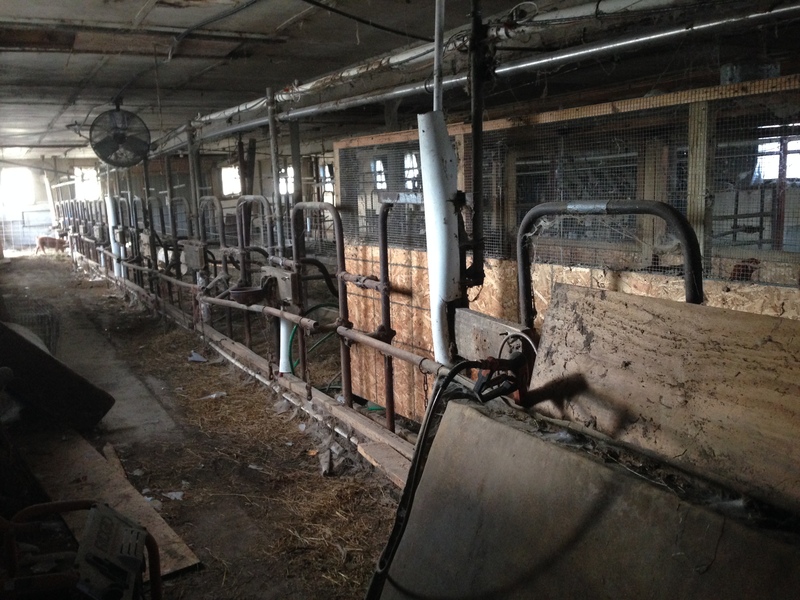 Inside, silage and cobwebs hang off the steel bars of the stalls where cows used to milk. 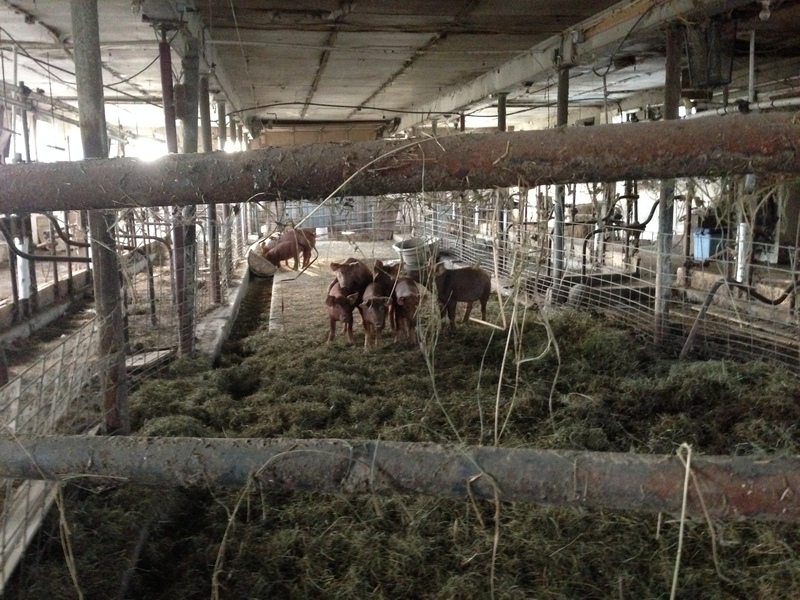 In the center of the room, adolescent Tamworth pigs graze at makeshift troughs. At the sound of our footfall and voices, the pigs stand at attention, then march forward in a line formation like a standoff, or maybe they’re just looking for a feeding. For years, Tilldale farm provided organic milk to the large organic, dairy corporation Horizon and other businesses. A few years back, a friend of Dan’s introduced him to the red Devon breed. When Dan tasted the superior texture and flavor of the breed, he was hooked. Dan began to sell off his dairy cows and introduce red Devon into his remaining herd. His cattle are now over ¾ red Devon with trace features of Angus. To diversify, he also raises a small herd of heritage breed, organic Tamworth pigs and organic chickens for meat and eggs. Dan walks us through the herd of cattle – the old mammas, young calves, and castrated adolescent males. On a two-day old pasture, they graze contentedly. “The red Devon is a docile breed,” Dan says. A black-faced lady follows me. I’m standing on her grass. She comes within two feet of me and stares at me from the side, with one large eye. Then she turns and stares me down face-forward with her two big brown eyes, wide wet nose, and tuft of wiry curls on her forehead. Not as docile as a dairy cow, she stands at a distance, resisting touch. In a small patch of pasture just beyond her, Dan points out his moveable chicken coop. 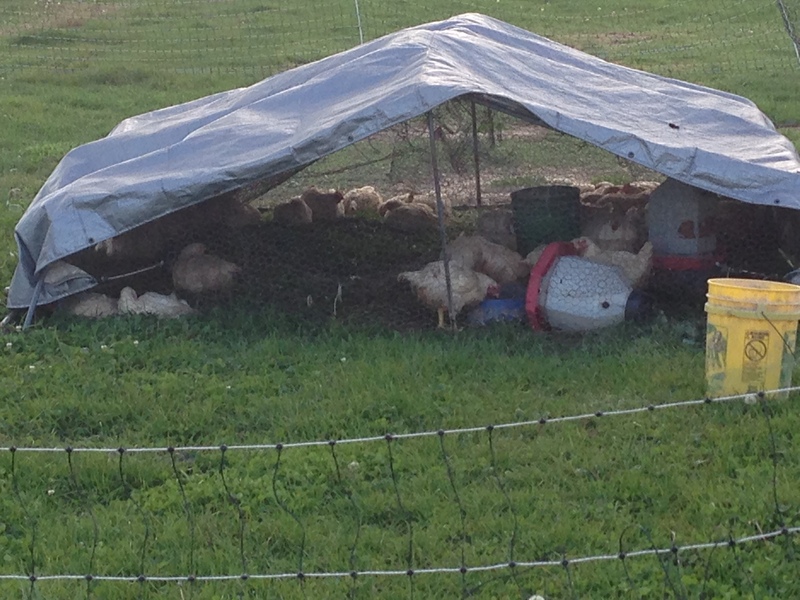 These organic chickens will use the pasture as 20% of their feed, and the rest is a mix of organic grains. The Tilleys plan to increases the number of organic chicken they raise from 100 this year to 250 next year. Off in the distance, a Holstein stands out with its characteristic black and white fur, a legacy of Tilldale’s dairying days. Dan remarks, “The Holsteins were all sold off to the neighbors.” They don’t make for good meat. The devon breed, in contrast to other breeds, has a strong, dense flavor with good marbling. As a heritage breed, it was bred to be raised entirely on grass. As the summer season closes in Upstate New York, the cows are just beginning to feed off of this year’s bailage. Bailage is a fermented hay taken from Spring pastures and cured over months in white, plastic-wrapped bales. Once baled, the hay must be half-dry to ferment into bailage, a nutritious mix of grasses that allows Dan to overwinter his cattle without grain supplement. This will keep the animals organic and solely pasture-raised all year round, even as they spend the coldest months in the barn. Five years ago, Dan retired the dairy farm. 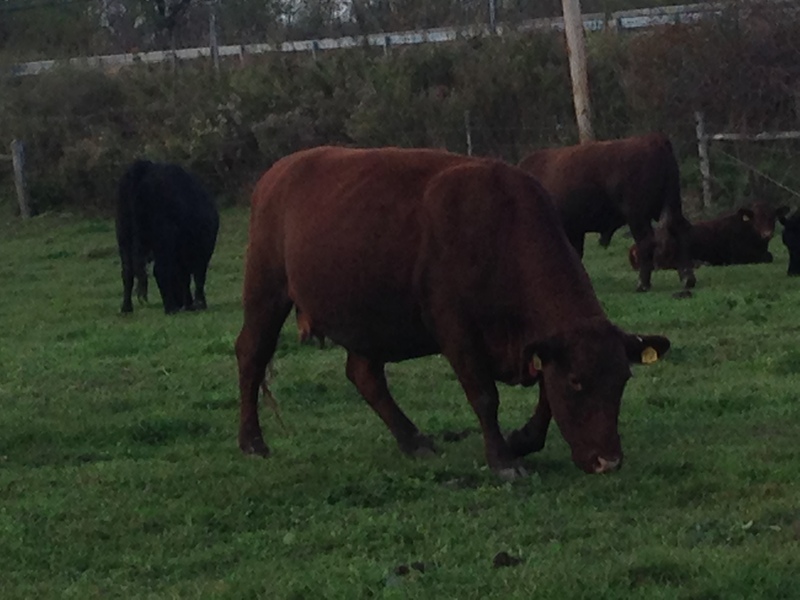 Currently, Tilldale farm has around twelve purebred red Devons. The breeding mother is eleven years old, and this year she gave birth to her first bull. For six years she bore heifers. A Devon herd is highly sought after and takes time to build. 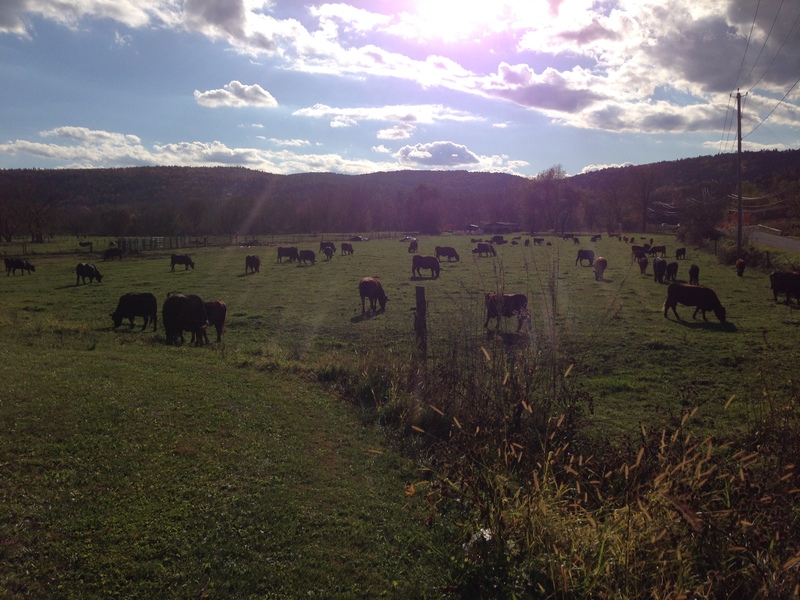 Overall, Tilldale Farm is home to about 150 cows. Each cow will pass the seasons happily there for about three years. The first year mother and calf will spend together; the second they distance themselves, growing larger; and the third year they will achieve the desired weight for them to be ready for market. The time and energy the Tilleys put into raising and overwintering the herd is different than other local livestock farmers who will buy adolescent cows at auction in late winter to early spring and push to get them up to weight and market ready by fall. This method saves them the expense of feeding the cattle through the cold, New York State winter. 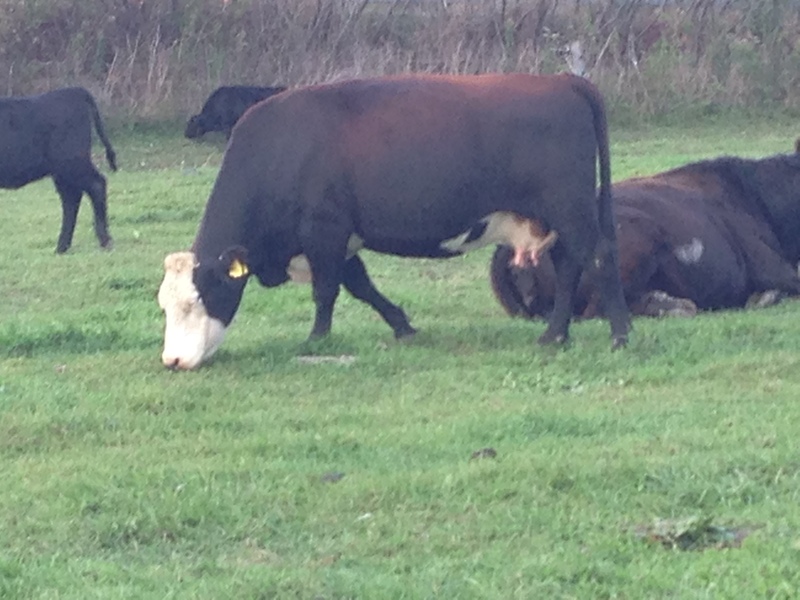 The cows purchased at auction may or may not have been raised on pasture. Even farmers who are pasture-raising their herd may feed the cows some grain both to get them up to weight and to give the meat the grain-fed flavor that Americans have grown accustomed to in the last thirty years. The Tilleys, by contrast, are committed to maintaining their herd from live birth to market on nutritious, organic grasses, and to raising their animals ethically, responsibly, and in a low-stress environment. This process takes about three years, and includes overwintering in the barn on bailage for at least two winter seasons. Walking back to the farmstead, we notice a woolly bear caterpillar sauntering along the grass. Eric Paul, owner of The Cheese Traveler, picks it up and lets it meander across the palm of his hand. 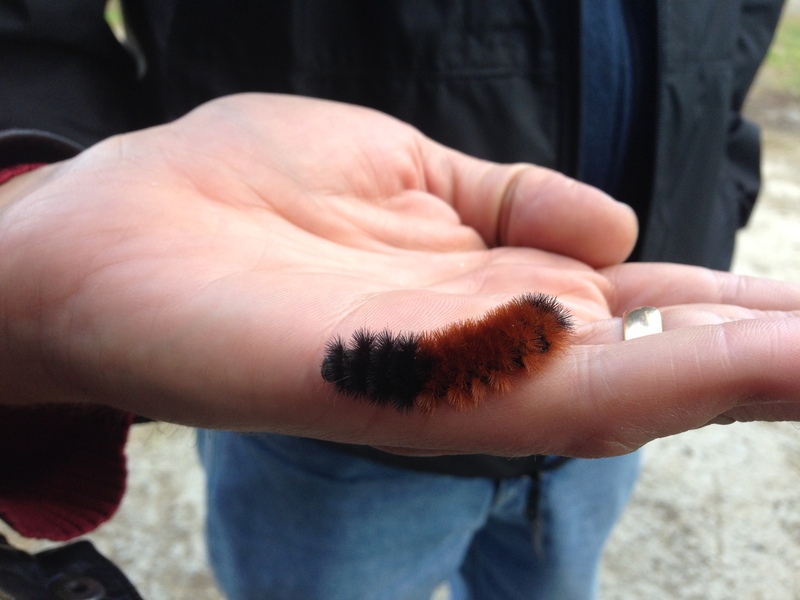 Old farmer’s lore tells that the longer the black band of the woolly bear caterpillar, the colder the winter. A yellow band in the middle presages a hard snow. “Looks like it’s going to be a cold winter this year,” Dan says. Tilldale beef and pork can be found in the Capital District at various local restaurants and markets. Flash frozen meats are sold at The Cheese Traveler and The Delmar Farmer’s Market. Chef Ryan serves up a delicious pulled pork sandwich at The Cheese Traveler’s cafe, and Chef Ian of Capital City Gastropub on New Scotland Ave. makes a delicious Tilldale organic beef burger. You can experience Tilldale meats in a variety of dishes at Gastropub and Mingle on Delaware Ave in Albany. The meat is also available for sale right off the farm – Tilldale sells CSA shares and individual packages. You can contact them by phone at (518) 686-7779 or by email at tilldalefarm@gmail.com. Their website is www.tilldale.com and they are also on Facebook https://www.facebook.com/TilldaleFarmNY.